If you're looking for a weekend getaway from Kolkata, head to Bishnupur. Bishnupur’s glorious past is reflected in its rich terracotta architecture, music and handicrafts such as pottery and weaving. The town derives its name from ‘Vishnu’, the majority of the people belonging to the ‘Vaishnava’ sect. It’s a pretty five hour drive from Kolkata, the landscape mostly dotted with sal and mahua trees, the gorgeous red soil lending its own beauty to the place. Bishnupur prospered in the 17th and early 18th centuries; that was when it developed a unique form of architecture with perhaps the most brilliant and detailed terracotta work in Eastern India. Fortunately, it has withstood the ravages of time, giving us a chance to appreciate and admire the work. Bishnupur is a repository of some excellent terracotta temples. The oldest brick temple here is the Rasmancha – built in the shape of a pyramid, by King Beera Hambira in the late 16th century. Other famous terracotta temples are Pancha Ratana Temple of Shyam Rai and the Jorebangla Temple of Keshta Rai built by King Raghunath Singh. The temple of Shyam Rai with its superior carvings and floral patterns was the first-of-its-kind in Bengal. Another attraction is the temple of Madan Mohan – a beautiful structure made of terracotta; its decorations and designs far surpassing those of Shyam Rai and Keshta Rai temples. You can find impressive scenes from the Ramayana, Mahabharata and the Puranas carved on the temple walls. 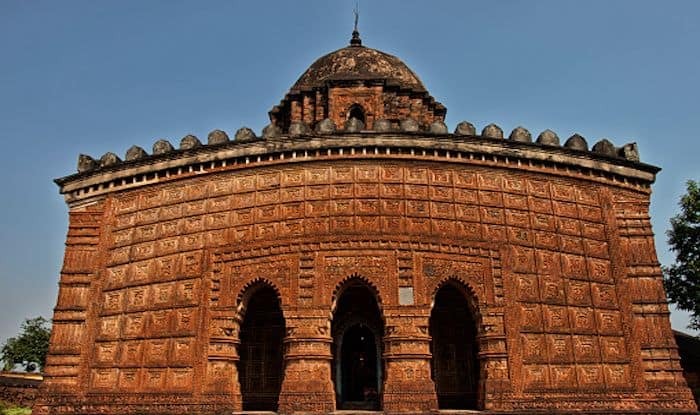 Apart from temples, Bishnupur has attractive bandhs or large tanks that offer good sightseeing; especially, the Lalbandh, Krishnabandh, and Pokabandh built by the Malla kings. They were consturcted to provide water to the villagers and to also protect the town from an enemy attack. A trip to Bishnupur is incomplete without buying the gorgeous Baluchari sari; they’re famous for having entire episodes of Mahabharata woven into its border and pallu.